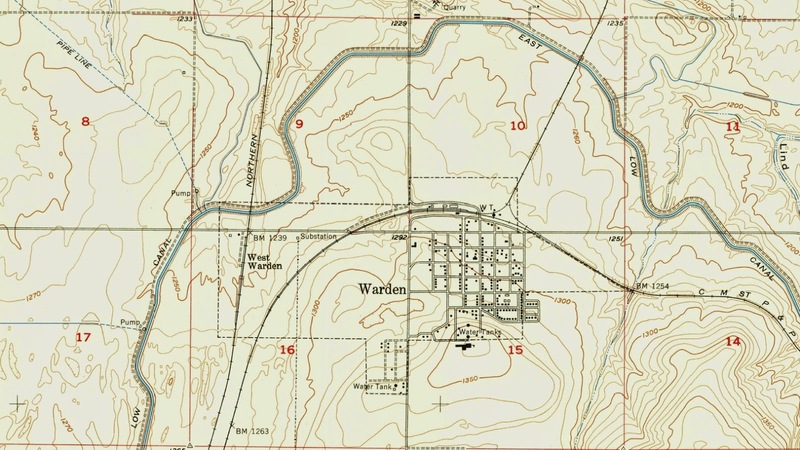 Much has changed in Warden since this map came out. The Northern Pacific, more or less a straight line from top to bottom in the map, is still in use as the Columbia Basin Railway. They have a bit bigger yard there, along with a newer building you might call the depot. The Milwaukee Road, curing through town, is gone beyond the east city limits, as well as most of the branch heading north to Moses Lake. All of this has been tied into the NP branch just south of town by a BN built connection. This is also run by the Columbia Basin. New to the town is a large canola processing plant, that gets unit trains from BNSF. Warden has never been busier than it is today in 2014/15.